It’s hot. The humidity hasn’t hit the 90% mark as of yet, but still, anything over 92ºF is hot. When the mercury threatens to burst through the top of the thermometer, I turn to airier fabrics — cottons and linens whenever possible. Yes, lightweight wool wicks moisture, but I don’t have any 1/4 lined, super 130’s frescos in the closet. Yet. If you are in a creative field, I encourage you to take the plunge and wear linen — white linen if you can get away with it. It really will make you feel very elegant. Add a blue linen blazer, at least, for those days when you don’t have to see clients or go to court. Sometimes it’s nice not to worry about wrinkles. I’ve wanted a white linen suit since the Christmas holidays, 1990, when I was fortunate enough to be afloat a 54′ power boat in the BVI’s. Somewhere around three in the morning, I was awakened by the racket coming from shore, about 100 yards from where we were anchored. Junkanoo had spilled onto the beach. As I peered with binoculars through the porthole, bleary-eyed with champagne, I saw a bonfire ringed with 35 or 40 people dancing and blowing horns, whooping it up. And around this festive group rode a whitehaired, tanned man on a bicycle, waving a bottle, barefoot, barechested, in a crumpled white linen suit. Easy in the islands. I would have added a pocket square. One must have one’s standards. 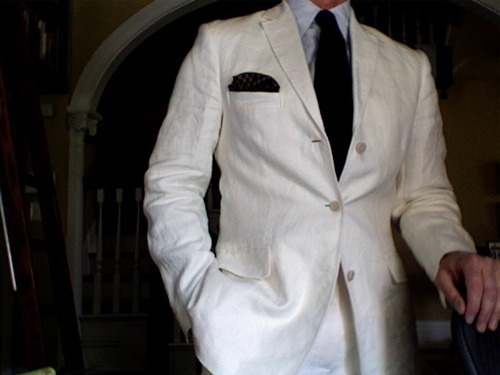 This entry was posted in Elegantology and tagged Elegantology, summer, tailored clothing. Bookmark the permalink. Lovely story. What happened next? I passed out. I don’t remember breakfast, but lunch consisted of freshly-caught- off-the-stern-and- grilled spiny lobster, more champagne and corn on the cob. That’s the life! Sounds amazing. We’re making plans to go sailing from San Diego to Baja, Mexico, stopping at deserted islands in the Sea of Cortez, dining off grilled dorado, tacos, and wine. BVI is on the list for next year. You said it LBT. If only I could bareboat! I have a good friend who does the islands every year, but he has reached the stage where he just heads for St. Barth’s. Oh, I am loving your tall tales and that white linen suit, you look positively smashing. My husband has his father’s white linen suit. Nothing says Summer like white linen. I also love it with a pale pink shirt and a silver gray tie! Why do you always flip your photos? EEL ~ Forgot to mention, that’s a very nice pic, BTW. How do you deal with the ‘see-through’ qualities of white linen? Hi Johnny, actually I don’t “unflip” them. They are taken using the integrated camera on my MacBook Pro and the Photobooth application. I think it gets my good side. LBT, heavy weight linen is your best bet. It drapes better, too. That said, I always make sure to wear heavier white knit boxers in case. Your husband is a lucky man, Mrs. PvE! I imagine that we all have good adventures to share… And thanks for the pink shirt/silver grey tie suggestion — it’ll be my choice this coming week! The fact of the matter is that there are more than enough designers offering jeans for all, but not all of these jeans can be worn by you. You should not only consider style, but you should also pay attention to quality in relation to price.